Cartoon character Bart Simpson is known for his mischievous ways, but international media drew the line at the suggestion that he had anything to do with the Syrian uprising. Rania Badawy then went on to present an 80-second clip from none other than The Simpsons, which was first broadcast on 2001. 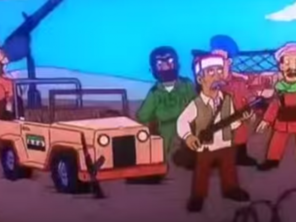 In the episode New Kids on the Blecch, the trouble-making Bart Simpson and his friends are tapped to form a boy band and are seen dropping bombs on an unnamed Arab country in a music video for their single, Drop Da Bomb. Badawy pointed out that the cartoon soldiers drawn in 2001 were pictured near a vehicle decorated with a version of the Syrian flag that opposition protesters and rebels only started waving in 2011. Writing for the New York Times, Robert Mackey points out that the Syrian opposition did not invent a new flag in 2011, as Badawy says, but rather adopted a version of the Syrian flag that had been used prior to the country’s 1963 military coup. There’s trouble in a far-off nation. “The animators were most likely (or, uh, definitely) referring to Iraq in this episode, not sowing the seeds for a complicated global conspiracy that would unfold a decade later. Good try though,” Samantha Grossman, writing for Time, wrote. The al-Tahrir report also garnered attention on social media, with users making sardonic comments. “U all [thought]#Pakistan Media [was] bad … #Egypt’s TV Anchor asks Did The Simpsons Start The War In Syria?” said one Twitter user. “Doh! 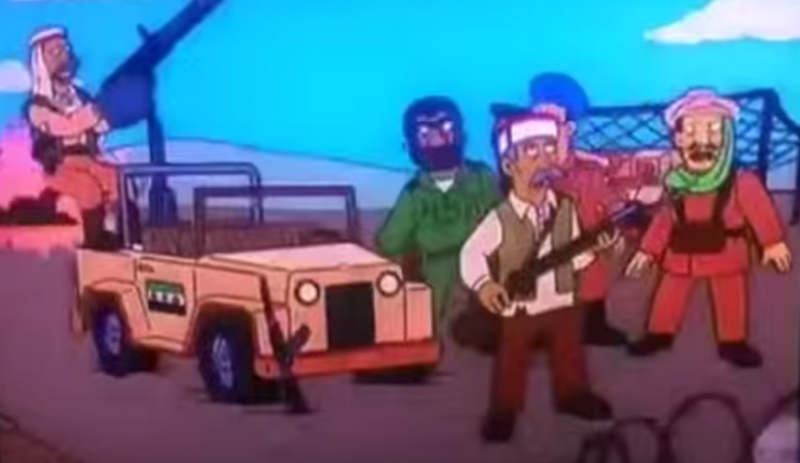 #Egypt tv offers up episode of #Simpsons as proof that foreigners were behind the whole Arab Spring thing,” tweeted user Richard Engel. The al-Tahrir report was posted to online by the Middle East Media Research Institute (MEMRI), with an English translation.